Where did Baphomet Originate From? Mentions of Baphomet have been found in documents dating from as early as the 11th century, appearing in an early Crusader’s letter dating to 1090. Although not in its current image, the name itself is said to have connections to early Islam, as chroniclers referred to mosques as “Bafumarias”. Some think Baphomet is an Old French corruption of the name Mohammed (which was Latinized to “Mahomet”), the Prophet of Islam. During the Crusades, the Knights Templar stayed for extended periods of time in Middle-Eastern countries where they became adept with the teachings of Arabian mysticism, which they brought back to Europe, forming the basis of what would later become western occultism. The Templars affinity with Arabian mysticism led to the Church accusing them of worshiping a Muslim idol named Baphomet. Arkon Daraul, an author and teacher of Sufi mysticism and magic argued in his book “A History of Secret Societies” that Baphomet came from the Arabic word “Abu fihama(t),” meaning, “The Father of Understanding”. Dr. Hugh Schonfield worked on translating the Dead Sea Scrolls as an expert on a Jewish cipher called the “Atbash cipher,” which was used in translating some of them. He claimed that when one applied the same cipher to the word Baphomet, it transposed into the Greek word “Sophia,” which means knowledge or wisdom, and can also be synonymous with god(dess). The Atbash Cipher is a Hebrew code which substitutes the first letter of the alphabet for the last, the second letter for the second to last, and so on. When the Hebrew letters spelling Baphomet are applied to the Atbash Cipher it generates the Greek word “Sophia”. The word “Sophia” in Hebrew is שופיא, and the Atbash form is בפעמת or “baf’omet”. The word BAPHOMET (Bet Pe Vav Mem Taf) with the Atbash Cipher (Shin Vav Pe Yud Alef) spells SOPHIA. Although written in Hebrew it reads as the Greek word “Sophia” again, meaning wisdom. The Hebrew Scribes or Rabbinic Sages, known as “Tannaim” (repeaters or teachers) use to write manuscripts similar to this called, “Plowing the Field” or “Ox-Turning” because when read, you’re supposed to read from right to left on the first line, left to right on the second line, back to right to left again on the third line, and so on, alternating each line. This kind of back and forth reading had been called the “Serpent Way”. Academically speaking, this method is referred to as “Bi-directional text” or “Boustrophedon,” which was used in many ancient scripts including Hieroglyphics. “The goat on the frontispiece carries the sign of the pentagram on the forehead, with one point at the top, a symbol of light, his two hands forming the sign of Hermeticism, the one pointing up to the white moon of ‘Chesed,’ the other pointing down to the black one of ‘Geburah.’ This sign expresses the perfect harmony of mercy with justice. His one arm is female, the other male, like the ones of the androgyne of Khunrath, the attributes of which we had to unite with those of our goat because he is one and the same symbol. The flame of intelligence shining between his horns is the magic light of the universal balance, the image of the soul elevated above matter, as the flame, whilst being tied to matter, shines above it. The ugly beast’s head expresses the horror of the sinner, whose materially acting, solely responsible part has to bear the punishment exclusively; because the soul is insensitive according to its nature and can only suffer when it materializes. In Levi’s depiction, Baphomet embodies the culmination of the entire alchemical process referred to as “The Great Work” where the Adept seeks to gain enlightenment through the union of opposing forces within. Baphomet is depicted as an androgynous character with female breasts and a Caduceus where an erect phallus should be. 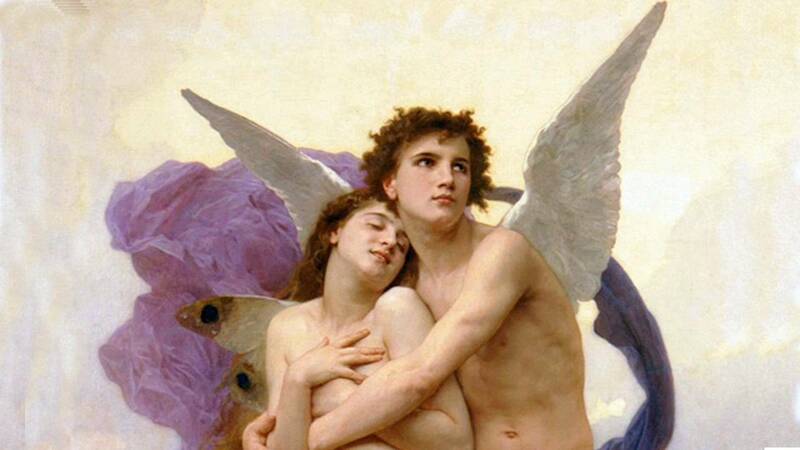 Since ancient times two souls and androgyny have represented the highest level of initiation in the quest for becoming one with God, or better yet, returning to God. Baphomet’s phallus “Hermes Caduceus” (the rod intertwined with two serpents) is an ancient symbol of Hermetism. Esoterically, the Caduceus represents union, and thus activation of the chakras, starting at the base of the spine and rising up to the pineal gland, via activation of serpentine energy. When heated or boiled, this force can be likened to an electromagnetic current. In esoteric terms we call this by its Hebrew name, “Shamayim” (fire+water). Baphomet is nothing more than a symbolic representation of the alchemical Great Work, where one unites opposing forces to generate Shamayim. 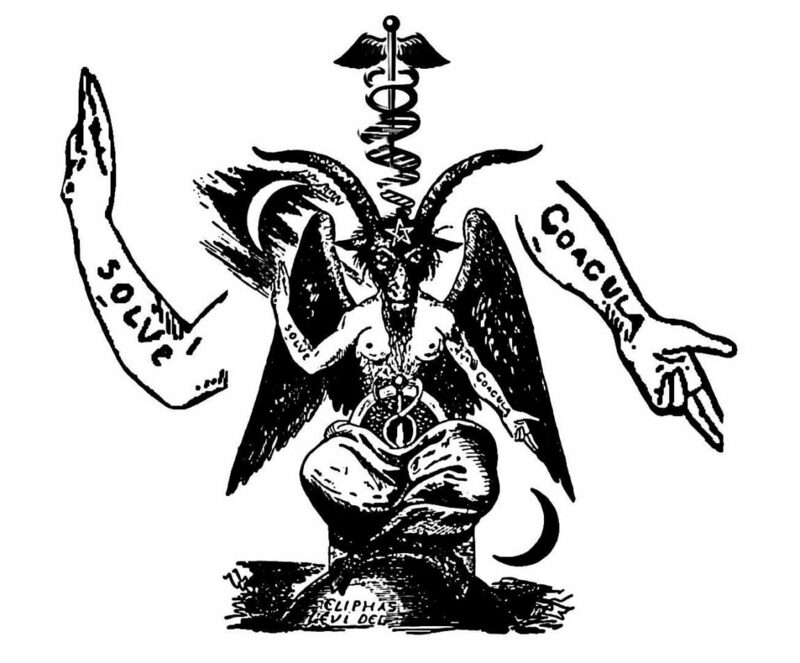 This alchemical process can be seen on the arms of Levi’s Baphomet drawing, where he wrote the words “Solve” (turning solid into liquid) and “Coagula” (turning liquid into solid); turning the philosophers stone into gold. Kabalistically, this is created through the spheres Binah, Chokmah, and Keter, which ultimately manifests through the door of Da’at on The Tree of Life. Again, this “Baptism of Wisdom” must be understood within the context of baptism by fiery-water (Shamayim). In Ancient Greek Religion “Metis” [Greek Μῆτις] meaning, wisdom, skill, or craft, belonged to the second generation of Titans as the spouse of Zeus. Zeus also bore the title “Mêtieta” (the wise counsellor), in Homeric poems. Like that of Metis, the birth of Athena “mind” [noũs]; or Athena Parthenos “Athena the Virgin” is the inner divine intelligence [theoũ nóēsis]; the one who has the mind of God [a theonóa]; she who knows divine things [a theia noousa]. Cognate to the word Athena “Diwia” we find words like “Diwali” (Sanskrit dīpāvali) meaning, “series of lights,” derived from “dīpam” (light, lamp and oil or “glow of light”). All of this makes much more sense when we understand Baphomet, like that of Lucifer, are the bringers of light; through the birth of divine wisdom, like that of Metis and Athena. When we raise our inner fire we’re creating Astral Light. This is exactly why Lucifer is the bringer of light *Luci-“light” and Fer “fire”; “Luci- Fer” or “Luci-Ferry”; to carry the light of fire within. The word “Baphḗ” [βαφή] comes from Ancient Greek “Báptō” [βάπτω], meaning “to dip” (submerge), and “I dye” (I colour “red”). With Proto-Indo-Eurpean roots *gʷabʰ- (to be deep, to be submerged). Cognate with Avestan “jafra” (deep), Persian “žarf” (container or envelope), and Middle High German “er-queben” (to smother). “Moreover, as Didron shows, there was a portrait of the Christ who had his body painted red (Because he is cabalistically the new Adam, the celestial man, and Adam was made of red earth.) It was a popular tradition that the Christ was of a red complexion. This too, may be explained as a survival of the Mummy-Christ. It was an aboriginal mode of rendering things “tapu” (sacred and spiritual) by coloring them red. The dead corpse was coated with red ochre, a very primitive mode of making the mummy, or the anointed one. Thus the God Ptah tells Rameses II. that he has re-fashioned his flesh in vermilion. This anointing with red ochre is called “Kura” by the Maori, who likewise made the Karest or Christ-Mummy. Rāga [Sanskrit राग] comes from a Sanskrit word for “the act of coloring or dyeing,” with Indo-European roots, as *reg-, which connotes “to dye,” with similar variants in other languages relating to the words “red” and “rado”. In the context of ancient Indian music, the term refers to a harmonious note, melody, or formula. The word Rāga appears in the ancient Principle Upanishads of Hinduism, as well as the Bhagavad Gita. The Mundaka Upanishad uses it in its discussion of soul (Atman-Brahman) and matter (Prakriti), with the sense that the soul does not “color, dye, stain, or tint matter. The Maitri Upanishad uses the term Rāga in the sense of passion, inner quality, and psychological state. The term Rāga is also found in ancient texts of Buddhism where it connotes passion, sensuality, lust, and desire. In the Naradiyasiksa, dated to be from the 1st century BCE, it compares and names each of the musical notes with that of a deity, describing them in terms of “varna” (colors). The Rāgas were envisioned by the Hindus as divine manifestation, and each musical note was treated as a god and goddess called, “Rāga-Rāgini”. Rāginī [Devanagari रागिनी] is a term for the feminine counterpart of a masculine Rāga. The symbolic role of classical music through Rāga was for spiritually purifying the mind and can be found in literature such as the Kama-sutra and the Nada-Brahman (metaphysical Brahman of sound). Rāgas that have “four swaras” are called “surtara rāgas”; those with “five swaras” are called “audava rāgas”; those with “six swaras” are called “shaadava rāgas”; and those with “seven swaras” are called “sampurna rāgas” which is Sanskrit for “complete”. In the Jaiminiya Upanishad it talks about the cyclic rising and setting of the world and sun, and is referred to as “The Music of Spheres” and according to Ananda Coomara Swamy, the root “svar” means “to shine” and “svr” means “to sound or resound”. Thus, we get “musical note” and “to shine” from “Swara”. There’s a proverb among Indian musicians that says, “through Swara, Isvara (god) is realized”. For the initiate, red can signify or mark our spiritual death and rebirth, to be dyed and renewed, or to be baptized through the blood of Christ (Christus-Lucifer). We only need to look at the color of the Muladhara or root chakra, where Baphomets erect phallus has been replaced by Hermes Caduceus, and we can draw our own symbolic significance as to it’s esoteric meaning. Baphomet represents divine Christus-Sophia consciousness, which is sound or vibration, which in turn becomes quanta light, there is really no distinction or separation here. Through baptism of fire and water, our serpentine (electromagnet) energy rises, beginning at the base of our spine, where our red root Chakra “Muladhara” resides. If enough heat is generated and sustained it will begin to activate all the other chakras, creating a rainbow body. The true path of initiation is simply in the act of becoming a beacon of light; a vehicle of light. By finely tuning our bodies we become a melodic melody, like that of the traditional Indian music scale known as Rāga. 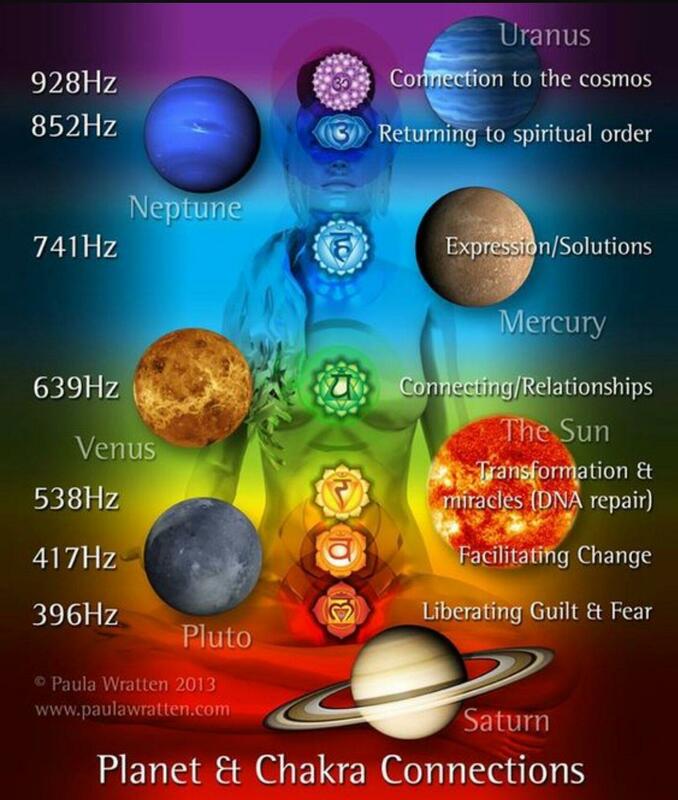 Our Seven Chakras or Seven Swaras (light and sound) are “Sampura Rāgas” (complete). Through the crafting of our rainbow body, we become “the music of the spheres.” This is how we return to our source of divinity. When we raise our vibration, we attract and refract the light of the gods, we become musical instruments (Swara) and vehicles of light (Isvara). This is how we unite the microcosm and macrocosm within.